When it comes to fashion websites, choosing the right design is imperative. Whether you’re highlighting your best models or showcasing your latest creations; one thing is certain: your site needs to have a high visual focus. Large images and plenty of white space will do wonders for your site. But, how do you go about creating a beautiful fashion website? The answer is WordPress, paired with a premium, high-quality fashion WordPress theme designed specifically for the fashion industry. In this roundup, we feature the best fashion WordPress themes available on ThemeForest in 2017. Best fashion WordPress themes on ThemeForest (2017). The WordPress themes for fashion blogs and magazine sites on this list feature nothing short of a stunning design, paired with modern website features, such as: SEO best practices, fast loading times, beautiful galleries, and tons of customization options. We also include a number of theme designs for selling fashion products. The first fashion WordPress theme on our list, Kloe, features a number of stylish home pages to choose from, allowing you to create a fashion portfolio, blog, online store, and more quickly in 2017. With beautiful parallax backgrounds and nicely organized galleries, Kloe makes it easy to showcase your style. This website theme design is also easy to customize, integrates perfectly with Visual Composer, and is fully SEO optimized. This theme is also available with Envato Hosted, which combines some of the best WordPress themes on ThemeForest with WordPress hosting, premium support and instant theme set up (all at a low cost). Take advantage of the quick, secure setup offered by our expert WordPress hosting team. Get your fashion website lunched fast! The Angel Model and Agency WordPress theme is fully responsive and is a great choice for fashion models, talent agency, and photography portfolio websites. Stunning full-width background images and the ability to use video backgrounds are perfect for showcasing photos of models or your photography. On top of SEO optimized code, custom sidebar generator, and page builder, this theme is also fully translatable thanks to WPML integration. 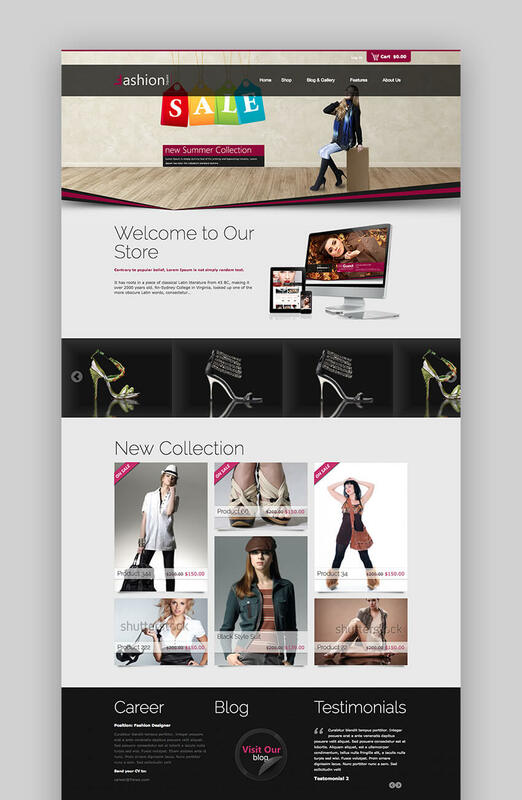 The Gilda fashion agency theme comes packed with unique features such as user registration and portfolio submission. The site design is perfect for fashion agencies that want to facilitate the process of recruiting new models in 2017. This theme has a rather minimal design and you can even create a shortlist of talent available for immediate booking. 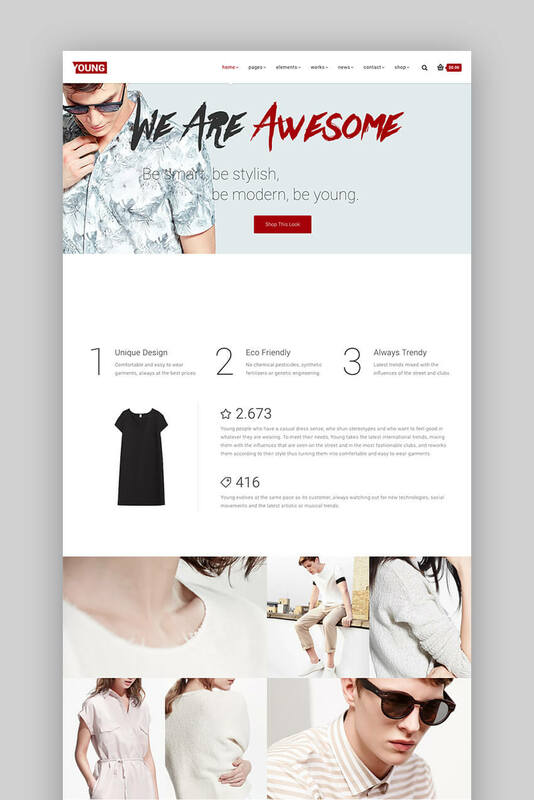 Fashion Shop is a clean responsive, e-commerce WordPress theme suitable for boutique, clothes store, fashion store, makeup products or any other fashion related website that wants an elegant online store. The Lavan WordPress fashion theme features a dark and responsive design, with more than 10 homepage layouts and easy one-click demo import. It’s easy to customize thanks to Site Builder page builder and comes with plenty of customization options if you’re not a fan of the dark theme. Very nice theme with awesome features. Well updated and supported by Kayapati. Recommended! Faxhion is a responsive fashion and model agency WordPress theme with a unique and elegant design. The theme integrates perfectly with Visual Composer and Master Slider WP Pro, so you can create impressive and unique layouts and stunning sliders to feature your models. The theme is updated for 2017. It has beautiful parallax animations and an extensive admin panel, packed with various customization options so you can easily modify styles, colors, fonts and other aspects of the theme quickly. The Casting agency WP theme is another great choice if you need a sleek theme for your fashion and modeling agency with an easy way for models to register and submit their portfolios. This fashion WordPress theme design comes with integrated user registration and model inquiry forms, beautiful sliders, and an easy way to create a membership site where your models can apply for gigs and manage their portfolios. 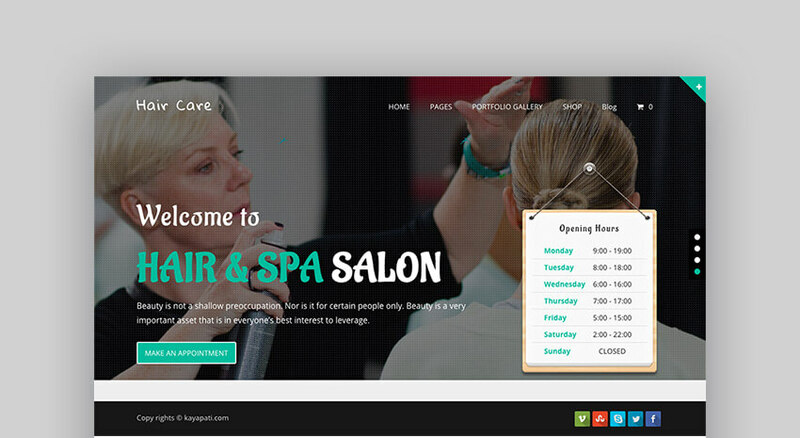 The Hair Care fashion WordPress theme is a great website design for hair salons, spa and beauty salons, and fashion agencies. A custom image gallery widget allows you to showcase your fashion creations or your models and you can easily customize the layout, colors, fonts, and more with the theme customizer. The theme also supports WooCommerce so you can easily sell fashion-related products in 2017. Top Model is a fashion WordPress theme designed with a clean and sophisticated design for 2017. It comes with various portfolio options to help you introduce each model and your fashion projects. You can also advertise your fashion events, fashion shows, exhibitions, and photo sessions. Amazing support, usually answered any and all questions that day, even with a different timezone). The Customization was very easy (I’m no WP expert either) so that was great. And the design is obviously very well thought out and visually pleasing. If you’re looking to sell your fashion creations, consider the Alteration WordPress theme. This theme works with WooCommerce and has a beautiful design that puts your fashion products in the spotlight. You can also make use of the page builder to easily change the layout as well as numerous shortcodes to add various features to your site. The Audrey fashion designer WordPress theme features an elegant design and plenty of templates for the homepage as well as the inner pages of your website. It’s compatible with several popular plugins which include Visual Composer and Revolution Slider and offers quite a few customization options on the backend. You can integrate various social media feeds on your site and use beautiful parallax and video backgrounds to capture the attention of your visitors. The Garbini fashion WordPress theme is perfect for fashion and clothing stores. The theme works with WooCommerce and is powered by Redux Framework and Visual Composer for easy layout control. Klambi is a modern and fresh WordPress fashion theme design, great for selling fashion products online. This theme supports elegant product lists and grids and comes with custom details pages and special offer popups. On top of that, the theme lets you easily specify delivery guidelines and product sorting variables. 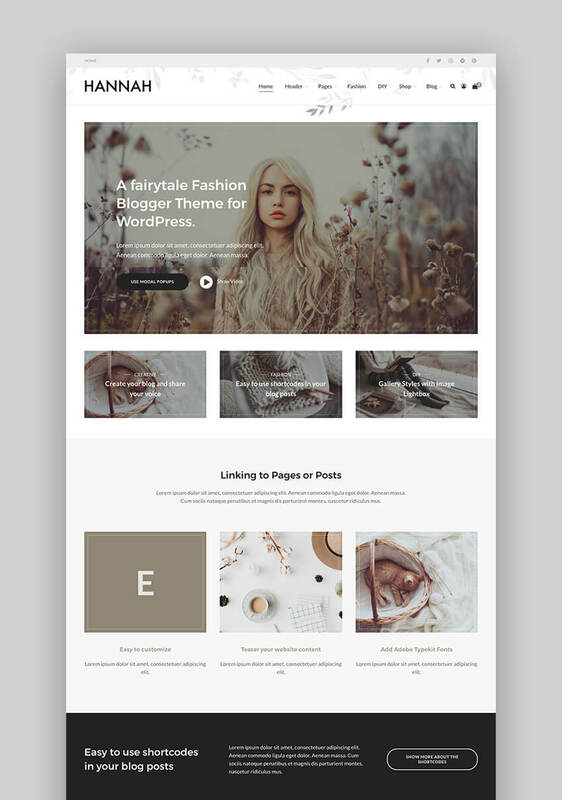 Try the Young Fashion WordPress portfolio theme if you’re on the lookout for a modern and flexible design that will allow you to showcase your fashion designs on your blog. Pixel Mafia is great! The theme is excellent and the support is helpful and patient with a terrible beginner like me. They have been gracious and went above and beyond. Consider the Look WordPress blog theme if you’re a fashion blogger. The theme comes with a beautiful grid design that allows you to feature your most popular articles and highlight images of fashion shows, outfits of the day, and more. It has a number of different demos which can be imported with one click and you can customize every aspect of the theme through the theme options panel. On top of that, the WordPress fashion magazine and blog theme is fully responsive and optimized to load fast. The Hannah CD WordPress theme is a beautiful, feminine design for fashion blogs. The theme comes with several custom widgets, including a carousel widget for featuring your most popular fashion articles. You can choose between several different article layouts and customize colors, fonts, and more. On top of that, you can easily embed promo boxes and stylish popups so you can build your email list. The Raspberry theme for WordPress fashion blogs features four unique demo layouts and easy one-click import. This stylish magazine WP theme is easy to customize with custom page builder and theme admin options. It has an elegant typography and responsive design that ensures your fashion website looks gorgeous no matter which device your visitors are using. The theme also supports video integration with YouTube, DailyMotion, and similar sites. If you want to blog about fashion, consider a fashion blogging theme like Raspberry. Similarly, if you want to create a website for your model agency, choose a theme like Top Model that will allow you to easily feature models and their portfolios. Lastly, pay attention to the design and choose one that aligns with your brand. You will need to invest in quality hosting to ensure your site loads fast and is available to visitors at all times. While there are many cheap hosting plans available, it pays to invest a little more, especially if you don’t want to worry about maintaining WordPress yourself. Envato Hosted – Quick WordPress sites installation and Premium hosting. A service like Envato Hosted is perfect for beginners as it takes care of all the technical details for you and it comes with WordPress pre-installed. You can also choose to have your theme installed from the beginning by one of our professionals, so all you have to do is customize the theme and start promoting your site. Once you’ve settled on your WordPress theme and setup hosting, the easiest way to start with setting up your theme is to import the demo content. Themes like Lavan or Julia make it easy to get your theme looking like the demo. Once the demo content has been imported, you can edit the pages to simply add your own images and text. You’ll also want to customize the theme to reflect your brand. Most themes come with a theme options panel that makes it easy to apply different styles. You can customize the colors, fonts, upload your own background, logo, and more. You’ll also be able to tweak the layout through a drag-and-drop interface so you can rearrange elements, replace a gallery with a slider or add an FAQ, accordion, or other elements. Some themes even integrate social sharing buttons so you can control where you want them to display. Envato Hosted – WordPress website design options galore. Creating a beautiful fashion website is not hard when you have the right tools to do it. Thanks to WordPress and one of our premium fashion WordPress themes, anyone can build a great looking website in a matter of hours. Browse through our collection of high-quality WP themes for the fashion industry and start working on your site.